Great place. Good communication by phone/sms/email with the owners. They make sure the guests are satisfied. The apartment itself - superb! Nice bathrooms, great comfort, location - very good. Nice and very helpful host; very secured area and building; spacious rooms; fully equipped kitchen; super clean; great location; good food in walking distance. Huge and very central apartment in Berlin - the key box in the lobby gave us great flexibility. The interior use outstanding for groups including kitchen and two bathrooms. Although we were traveling for business it felt like a shared flat! Beautifully restored building with three large bedrooms, two bathrooms and a very large kitchen/dining room/living room space. Friendly welcome, space, heating. Good for quiet groups. Location is good too with nearby Lidl and Edeka if you want to buy some food. The house is very nice, old and stylish, but in good condition. Everything inside is top quality and clean. 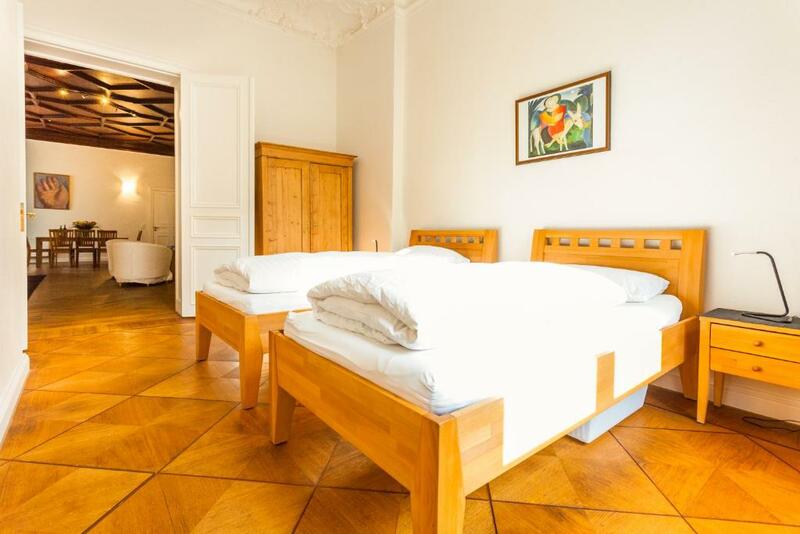 Lock in a great price for Downtown city landmark near Checkpoint Charlie – rated 9.1 by recent guests! 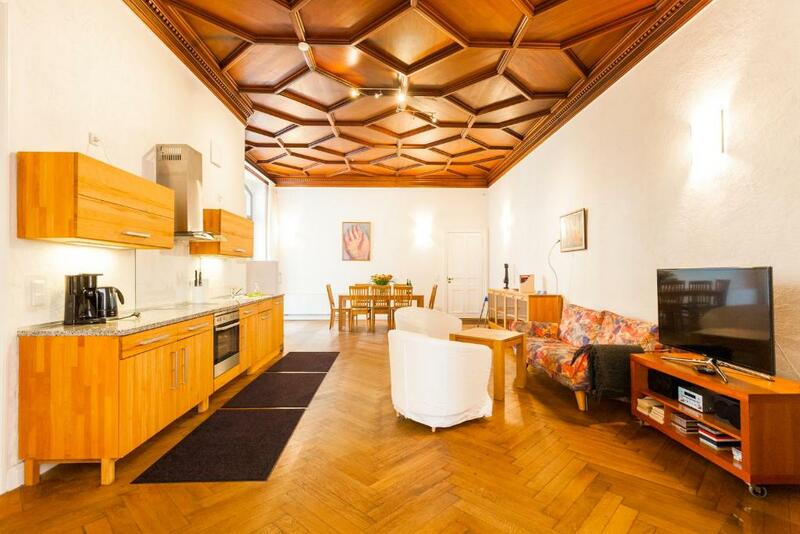 One of our top picks in Berlin.Just 1,800 feet from Checkpoint Charlie, this elegant apartment enjoys a central location in Berlin’s Mitte district. It offers a spacious self-catering apartments with free Wi-Fi access in an historical building. 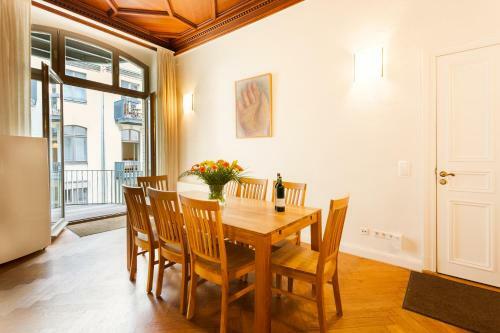 Downtown city landmark near Checkpoint Charlie features bright rooms with high ceilings, parquet flooring and original details. It consists of 2 or 3 separate bedrooms, living room and 2 bathrooms. 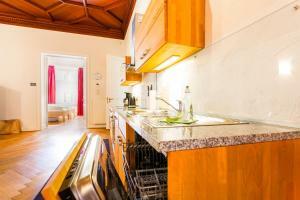 The apartment’s fully equipped kitchen is ideal for preparing meals at home. There are numerous cafés, bars and restaurants within 1,650 feet of Downtown city landmark near Checkpoint Charlie. Located on the border of Mitte and trendy Kreuzberg, sights nearby include the Jewish Museum (650 feet) Gendarmenmarkt (2,950 feet), Brandenburg Gate and the futuristic Sony Center at Potsdamer Platz (0.9 mi). The apartments are directly located on the popular Friedrichstraße shopping street. Kochstraße Underground Station is 1,650 feet from Einzeldenkmal der Friedrichstrasse and provides easy links around the city. 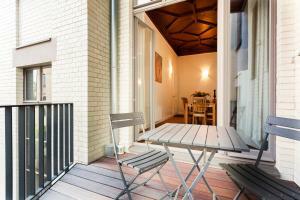 뀐 Located in the top-rated area in Berlin, this property has an excellent location score of 9.1! 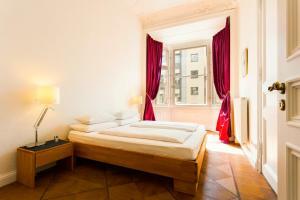 When would you like to stay at Downtown city landmark near Checkpoint Charlie? 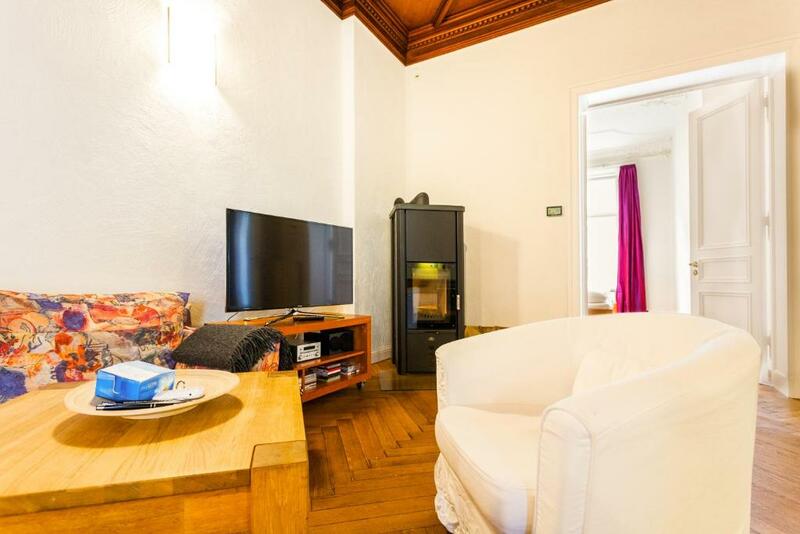 This superior apartment features 3 separate bedrooms, 2 private bathrooms with shower, a living room with kitchen and a balcony. This superior apartment features 2 separate bedrooms, 2 private bathrooms with shower, a living room with kitchen and a balcony. MAGICIANS, THE GREENS, BANKERS AND FILMMAKERS The house is the national heritage monument of one of the best-known areas of Berlin, Kreuzberg, also known as X-Berg, in one of Berlins most famous streets. Gutschow House, built in 1895, an important work of historicism (Neo-Gothic and Neo-Renaissance), is due to the elaborate façade design, its location, its history and as the only house in the area that 100% survived the World War II, the symbol of southern Friedrichstrasse. Here was from 1910 to 1990 the Mecca of the magicians through the magic headquarters of the world-famous and respected magician Conradi-Horster. Its magic protects until today the uniqueness of this place and its inhabitants. In 2006, the Greens conjured up a unique opportunity for the then tenants: the right to buy the entire house, 21 apartments. But why has only a mother with two children made use of this right and pledged to pay within 30 days a million amount that she did not have? How could she stand up to gentrification fighting bankers and lawyers with the help of filmmakers? MyBerlinStyle is this exciting past and present. MyBerlinStyle family: a philologist and translator born in Tbilisi, Georgia, a filmmaker born in Bucharest, Romania, two children born in Berlin. Before trained and worked in United Kingdom, Poland, Spain and Moldova. We live in the same house, enjoy meeting our guests, and if you wish, are eager to exchange experiences and tell the full story of MyBerlinStyle during a great weekend brunch in one of the restaurants we like. House Rules Downtown city landmark near Checkpoint Charlie takes special requests – add in the next step! A EUR350 damage deposit is required 14 days before arrival (about USD393.92). This deposit will be fully refunded 14 days after check-out, as long as there isn't any damage to the property. Downtown city landmark near Checkpoint Charlie accepts these cards and reserves the right to temporarily hold an amount prior to arrival. Please note that the property does not have a reception. The property can only be reached by phone between 10:00 and 20:00. Check-in is only possible until 20:00 at the latest. Late check-ins are available yet need to be confirmed and free luggage storage is provided. After booking, guests must call the property to arrange the key handover. Please note that all apartments are located on the 2nd floor, and there are around 50 steps up from street level. Not every apartment can be accessed by elevator/elevator, so please ask the property if you need an apartment offering elevator/elevator access. Cash payment is not accepted at the property. Please also contact the property in advance if you will be traveling with children and give their ages. A maximum of 4 children can be accommodated per apartment. Please note this accommodations is strictly nonsmoking, except for the balconies. It is also a quiet building which is suitable for families or professionals and not for groups drinking a lot and being loud or coming back drunk in the night and disturbing the neighbors. Loud parties are strictly prohibited. A security deposit of EUR 350 per booking is required to cover incidentals. Please note that by losing one or more keys, key locks will have to be changed and you will lose the whole deposit. Public parking spaces are available free of charge on the street, and there is a private parking area within 656 feet, available for a fee of EUR 12 per 24 hours. A damage deposit of EUR 350 is required. The host charges this 14 days before arrival. That's about 393.92USD. This will be collected by credit card. You should be reimbursed within 14 days of check-out. Your deposit will be refunded in full by credit card, subject to an inspection of the property. The accommodation is very spacious and a great place to relax after a long day in Berlin. Perfect central location in a very nice building. The hosts are very quick to respond to any questions. building is old and quite historic with the unit that has elevator access and is super spacious and very clean, it has two bathrooms and can accommodate more than 6 people. the furniture is standard and kinda rustic look but still comfy and lovely. huge smart tv in the living room with all the video streaming programs provided. wifi is a bit slow during our time there but its not the owners fault probably from provider) and we dont care much. nearby on street parking is actually easy to find, and its quite close to some shops and restaurants. 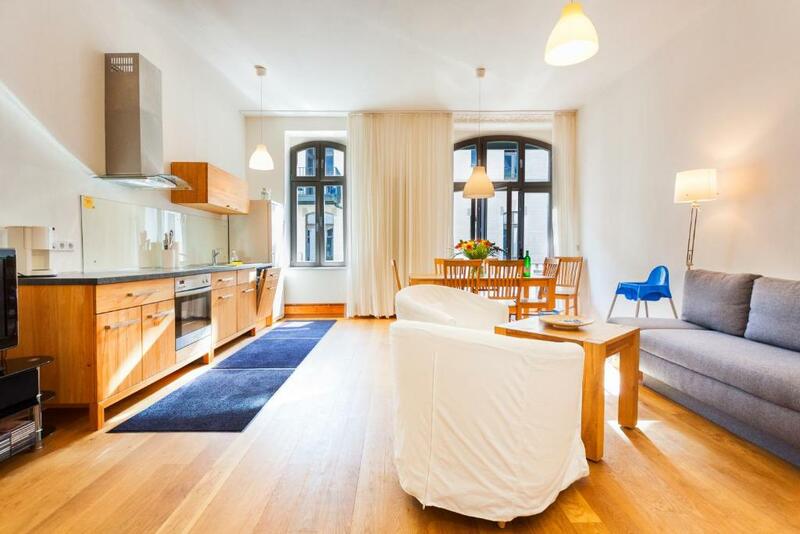 its within the street of freidrichstrasse shopping area and also the checkpoint charlie so location is quite perfect for us. owner is a bit stiff and straight-forward but he's cool and willing to help with everything. he provide free cellphone to contact him in any case i found that quite assertive. Small point - the need to tip-toe around the apartment. Downstairs neighbour called to complain requiring noise to be kept to minimum after 8pm. Having children walking over and back was the cause. "Quiet building" is noted in the middle of the accommodation description. Perhaps this should be listed at the top and repeated on arrival by the hosts. There is a confusing price system, even for the owner:) So pay attention to the extras like, cleaning, number of guests and their age, parking etc.